Relaxed luxury Pauanui Beach accommodation, sitting just behind the reserve of this iconic Coromandel white sand surf beach, the location doesn’t get any better than this. Ocean Breeze Pauanui is a boutique apartment complex providing stylish self-contained apartments ranging in size from one to three-bedroom. Our individually decorated apartments, meld modern and spacious interiors with function by offering a full kitchen, washer and dryer, air-conditioning, free WIFI, Sky Television and CD/DVD setups. Enjoy a room service breakfast or morning coffee on your patio or balcony, read and unwind poolside on the loungers or later on, soak in the outdoor spa pool while star gazing. Ocean Breeze Pauanui provides everything you need for the perfect beach breakaway. Our apartments are self-catering. We provide a starter pack, which includes selected specialty teas and coffee, milk, luxury bathroom provisions, dishwasher powder/liquid and clothes washing powder. It is expected that you will provide your on-going supplies. Additional supplies are available for purchase at minimal cost from reception if required. As your apartment contains a washing machine and dryer, daily room servicing is NOT provided, but can be arranged if required, at an additional charge. Bustling in the summer months with people and activities, Pauanui then slows down offering a relaxed pace and a remedy for those wanting to get out of the city and unwind. But if activities and adventure is more for you there is plenty on offer from beach walks to more challenging hiking and climbing, boating, fishing, jet skiing, kayaking, golf, tennis and cycling. 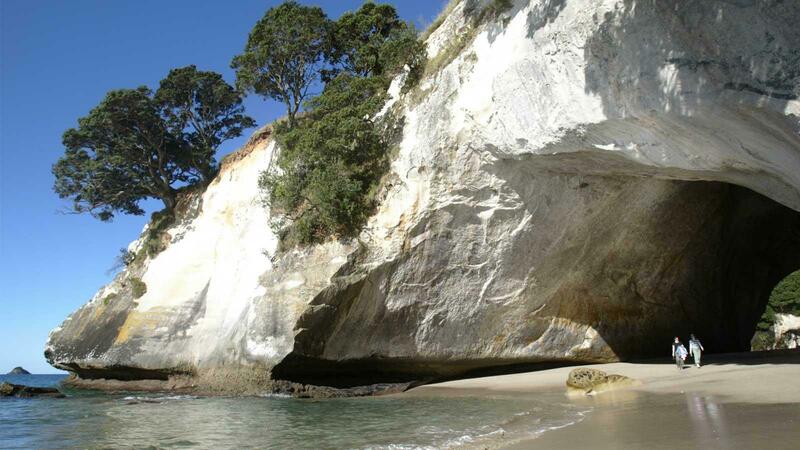 Ocean Breeze is also just a short 40 minute car trip to Hahei and the famous, picturesque, Cathedral Cove and Hot Water Beach. Choose to do as much or as little as you like. 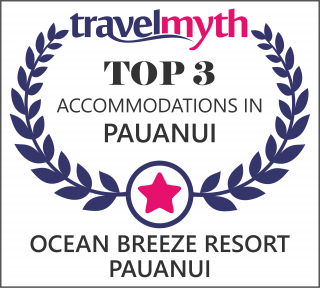 Ocean Breeze Resort Pauanui has been ranked as on of the top 3 accommodations in Pauanui by Travelmyth. Individual apartments sit adjacent to the landscaped courtyard with furniture settings and pool loungers provided. Guests may use the outdoor saltwater swimming pool, heated from Labour Weekend (October) to Easter (April) and the hot spa pool which is conveniently shade screened from the heat of day. Situated on the east coast of the Coromandel Peninsula, Pauanui (meaning Big Paua in Maori) is located less than a 2 hour drive from Auckland, Tauranga and Hamilton. The township has a mixed population of permanent residents (approx 800) and holiday makers. During the busy Christmas summer holidays the population grows to around 15,000.